Modern Healthcare: While your confirmation received bipartisan support, several Democratic lawmakers said the FDA hasn't done enough on opioid abuse. Dr. Robert Califf: They should be concerned and even upset because this is a massive epidemic with more people dying from opioid overdose or related drugs than auto accidents in the U.S. I understand their concerns and degree of passion, but also would hasten to say that the FDA is working hard on this topic. MH: What are your top three priorities on opioids? Califf: We have a very specific action plan that has a lot more than three items. You could sort of put them into buckets. First is reducing the overprescription of opioids by providing practitioners and patients with better information. Second would be to prevent the deaths that are coming from overuse of opioids by making therapies like naloxone available on a broader basis. Third would be the development of abuse-deterrent formulations. In the long term what we need is much more effective pain management as a national priority and the development of other therapies that are effective that are not addictive. MH: What are your other top priorities? Califf: The No. 1 priority during the time that I have at the FDA is strengthening the workforce. This means hiring top-notch people, because the world is changing so quickly with biotechnology and information technology coming together into an exciting revolutionary phase across the spectrum from agriculture to food products to medical products. It also includes making the FDA as good of a place to work as possible for the highly talented people who are here. The FDA must evaluate increasingly complex information to make good decisions on behalf of the public. So we need the best people, and that includes keeping the pipeline full, but also keeping people happy when they work here. The second big priority is what I will call evidence generation. We are in this amazing time where most everyone in the U.S. has an electronic health record. We have a massive number of registries being developed that deal with medical products. We have real-world information coming in from wearable devices and social media. Capturing that information, integrating it and making use of it is a big deal. MH: Lawmakers over the past year have been pushing to streamline the FDA's process for reviewing drugs and medical devices through the 21st Century Cures Act. Are there ways the agency could expedite the review process without jeopardizing public safety? 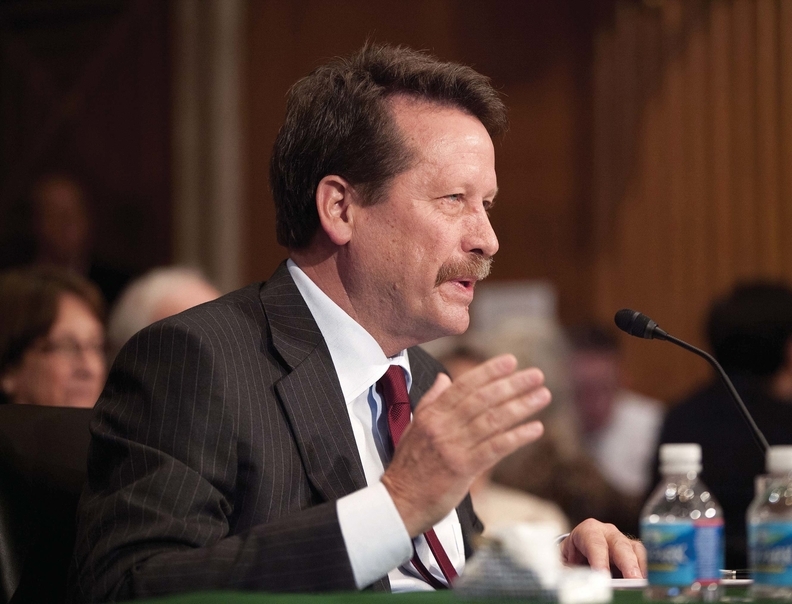 Califf: We have to make sure the American public maintains confidence in the FDA. If the doctor prescribes a drug or puts a device in you, we don't want the public to have to stop and think, “Is this OK?” So safety is the No. 1 issue at the FDA. We are way ahead of other countries in terms of speed of review for drugs. We don't want anyone to believe we are going to approve everything. Some things should not be approved. The key is the timeline to reach that decision. We are faster than other countries, and the U.S. gets first market access more than any other country. With devices, we have had problems. We don't think our standards have been too high. We think other countries may need to up their standards a bit. Califf: We want to look at every possible way to make things efficient. But we don't want to sacrifice safety. Different diseases have different needs, and different products have different needs. If we look at what is happening in oncology, we have four different ways that things are expedited. Sometimes they are all used in combination when it really is a breakthrough. We have been very responsive to patients (in) giving access more quickly. It is a very reasonable thing to do. Then we have to make sure we have a great post-market system and there is a lot of energy going into that. MH: How do you plan to revamp the FDA's post-market surveillance of medical devices? What role do you see the unique device identifier program playing within that? Califf: This is a very high priority for me. Much of my history as a cardiologist was spent developing registries for devices and procedures. And I am very aware of the tremendous value that can come from having a systematic approach to assessing technologies as opposed to a more haphazard approach, which was the way much of it was done in the past when we depended on individual clinicians detecting adverse events and reporting them. We are in an era now where we can use existing data sources. It's happening in drugs through the Sentinel system. Congress told us some years ago to develop a systematic approach to looking at electronic claims data for over 100 million Americans. It is used to check out safety signals when they occur. What we want is something similar for devices. MH: What about adding unique device indentifier codes onto Medicare claims? Califf: It is essential that we have UDIs. We are working with CMS to get this done as quickly as we can. For high-risk devices, we can use registries in combination with EHRs to get a lot of this data. But it would probably surprise a lot of Americans to know that that is not happening now. We really see a need to make this happen, but it is complicated. MH: There is a backlog on generic drug reviews. What are you doing to lessen that backlog? Califf: There was no funding for dealing with generic drugs until recently. We have developed a systematic approach to the backlog. There is no backlog for new applications now. What we have are some piled up old backlog applications where we prioritized the one where there was not an available generic on the market or there was a special reason to put it at the front of the queue. Now that the funding has kicked in, we are rapidly working through the backlog. MH: What advice did Dr. Margaret Hamburg, your predecessor, give you? Califf: When I talked with Dr. Hamburg before coming to the FDA, she gave me a lot of advice tied to the experience that she was having. She gave me very sage advice about how to stay calm in the face of many things going on around you in which very hard decisions need to be made, where regardless of the decision, somebody is going to be disappointed. You really have to have a strong internal compass in this job to make sure that you keep your eye on doing the right thing, despite all the pressures and the disappointed people when things didn't go their way.